Bike Ride In Anchorage: Bike along the Coastal Trail to spot moose and local wildlife. Visit the Alaska Native Heritage Center to learn about Native Alaskan customs, culture and traditions. Private Jet Boat Excursion In Talkeetna: Take an exhilarating jet boat ride along the glacier-fed Susitna River into the Alaskan wilderness. Afterward, enjoy dinner in Denali National Park. Happy Trails Kennels And The Iditarod: Cool your tracks at Happy Trails Kennels and go behind the scenes to learn the history of the Iditarod, the world's most famous sled race. Meet the racing dogs and the season's litter of eager puppies! Alaska Railroad And The Kenai Peninsula: Hop aboard the Alaska Railroad for a scenic ride along the Kenai Peninsula. Cruise through gorgeous Resurrection Bay and get an up-close view of otters, seals, porpoises and other sea life. Discover the beauty and majesty of “the last frontier” on an Alaska family vacation. Home to Denali, the highest point in North America, as well as volcanic islands, over 3 million lakes, and 16,000 square miles (41,439 square km) of glacier ice — you'll explore some of the most stunning landscapes and terrains in the world — by train, jet boat, and bike. Unwind as your Adventure Guide checks you into your spacious room at this modern, full-service hotel. Ask your Adventure Guides for suggestions as you take the remainder of the day to explore Anchorage on your own. Celebrate your first night in Alaska and the beginning of your trek with a true Alaskan seafood feast! Take a coach to Bridge Seafood, a unique restaurant that spans the waters of an urban salmon stream. Fuel up on breakfast at the hotel this morning before heading out to the scenic trail of Cook Inlet. Bike along the coastline and soak up stunning views of the Chugach Mountains. Keep an eye out for local wildlife, like bald eagles soaring overhead and moose ambling on the shore. After the bike ride, meet a bald eagle up close at this fascinating presentation in the park. A handler from the local rehabilitation center introduces you to one of these majestic birds as you learn all about the habits of the general population, as well as the particular bird at hand. Take the opportunity to ask questions and snap photos of this amazing creature, the national bird of the United States of America. Join your fellow Adventurers for lunch at the Alaska Native Heritage Center and share your first impressions of The Last Frontier! Celebrate the heritage of Native Alaskan cultures as you learn about the ancient traditions and stories of Alaska's first people. Explore the center with a guide and then be blown away by feats of balance, strength and dexterity at a private demonstration of the Native Youth Olympics! Afterward, Junior Adventurers explore the village sites in a whole new way as they embark on an outdoor scavenger hunt for various Native items. Explore the city below the majestic Chugach Mountains, where the midnight sun smolders on the summer horizon. If you need recommendations for dinner, ask your Adventure Guides! Depart Anchorage by coach and voyage to the charming village of Talkeetna. Rich with natural beauty and local color, this small town at the edge of Denali National Park boasts some of the best outdoor sporting in Alaska! Spend some time on your own before lunch exploring the town. Relax with a hearty lunch served on an outdoor deck with sweeping views of Mount McKinley. Board a jet boat for an exhilarating scenic cruise along the glacier-fed Susitna River and into the Alaskan wilderness. Then, continue by coach to your next hotel, the Grande Denali Lodge, perched high above the spectacular Denali Valley. Gather at the Prospectors Historic Pizzeria & Alehouse for a hearty pizza dinner and generous portions of rustic charm. Check out the collection of antique Alaskan photos, artifacts and maps for a special peek into the past. Salute Alaska as the 49th state with their 49 beers on tap. Experience the breath taking beauty of Denali National Park on this private bus tour that takes you and your naturalist guide deeper into the wilderness where you'll hike among the local wildlife. Stop for a picnic lunch amid the beauty and serenity of the pristine wilderness that surrounds you. 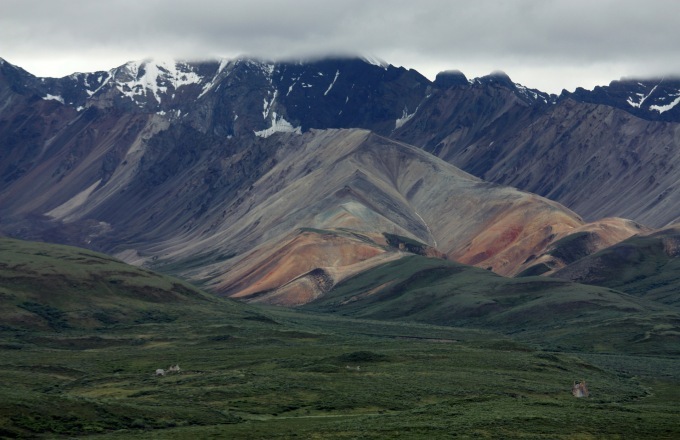 Following lunch, take some time to see Denali National Park on your own. Keep your eyes peeled for a variety of wildlife, including roaming Dall sheep and soaring golden eagles. Hike through novice or expert trails, or take the rest of the day to relax back at the lodge, enjoying spectacular panoramic views of the landscape. For dinner, the local cuisine of Denali favors fresh seafood and delicious grills. Ask your Adventure Guides for recommendations. Be swept off your feet by the stunning, panoramic views of the Denali Valley as a mountain climber joins you to share his experiences climbing Mt. McKinley. Feel free to check out his climbing gear and ask questions! As you blaze through the great frontier of Alaska, cool your tracks at Happy Trails Kennels owned by award-winning dog musher, Martin Buser. Your visit includes an exciting sledding demonstration, plus an up-close encounter with the racing dogs and this season's litter of puppies. After lunch, continue your guided visit to the kennel. Learn about the history of Iditarod and the loving care the dogs receive. Take a tram up to the mountaintop perch where this restaurant offers jaw-dropping views of the Cook inlet and surrounding glaciers. If the sights don't knock you off your feet, the food will! Adults will enjoy dinner at their leisure, while kids set off for a special Junior Adventurer's meal. After a private dinner at the hotel, Junior Adventurers head outside for an active night full of entertainment with the Adventure Guides. Kids will learn to spin an Eskimo yo-yo, play soccer or join any one of the other lively games planned for the evening. All aboard! Wind through the stunning stretch of wilderness between Girdwood and Seward in a well-appointed car that includes an outdoor viewing deck—the only one of its kind in the world! Your journey will take you through Placer River Valley and Moose Pass, a former railroad construction camp, before arriving at your destination of Seward for a full day of sightseeing and exploration. Cruise along the jagged cliffs and alpine glaciers of Resurrection Bay on this 4.5 hour, fully-narrated tour where you'll learn about the area's rich history while keeping an eye out for marine wildlife — including whales! Enjoy the finest flavors of the area with a buffet style lunch of wild Alaskan salmon and prime rib. Take to the scenic streets of one of Alaska's oldest communities where you can check out the local art galleries or the Alaska SeaLife Center. Be sure to look for the hand-painted murals throughout the town, and ask your Adventure Guides for some tasty dinner recommendations. Surrounded by mountains and hanging glaciers, the Alaska Wildlife Conservation Center is the perfect setting to see firsthand the conservation efforts taking place in Alaska. After exploring the Center with a naturalist and getting up close and personal with bears, moose and bison, learn how they have been rescued and rehabilitated. Get a good seat when one of the Center's rescued family members makes a special appearance. Lunch and the afternoon are yours as you explore the year-round resort community of Girdwood. Charming shops and friendly folks are just a few of the things you'll come across as you leisurely stroll the streets of this historic gold mining town on your own. Ask your Adventure Guides for dining ideas. As your Alaskan vacation comes to a close, join your travel friends back at the resort for a farewell dinner. Get into the rhythm during a performance of traditional dancers and drummers as Alaska's Native heritage comes to life before your eyes. After your last breakfast in the Land of the Midnight Sun, board pre-arranged transportation to the airport and bid each other farewell.